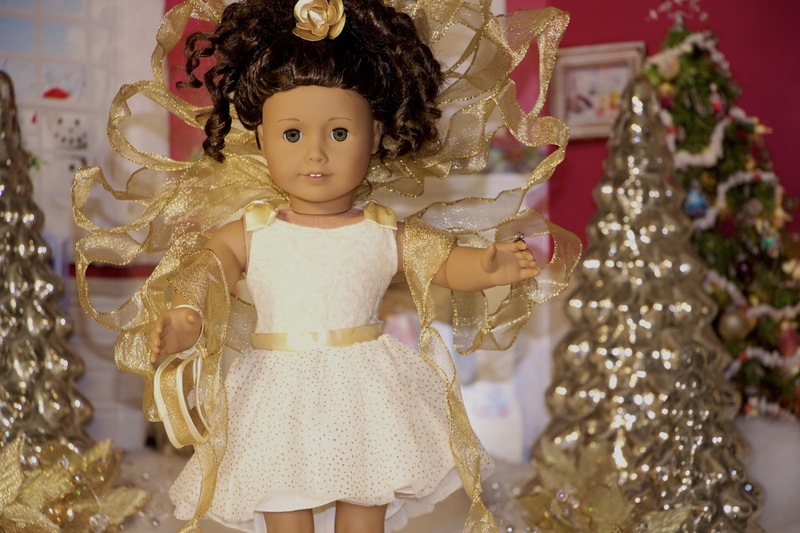 The American Girl Spirit Holiday Fashion Show had many Truly Me girls modelling their choice of holiday dresses on the runway. Truly Me doll #44 Lilly is wearing one of this year American Girl's NEW dresses, the Gorgeous Gold Outfit. The dress is a beautiful creme colour with gorgeous rich details. The shiny, full skirt with golden metallic accents and a two layer cream tulle underneath makes this dress stand out. A golden satin sash at the waist, a textured golden bodice and satin ribbons bows at the shoulders bring the dress together for a stunning look. 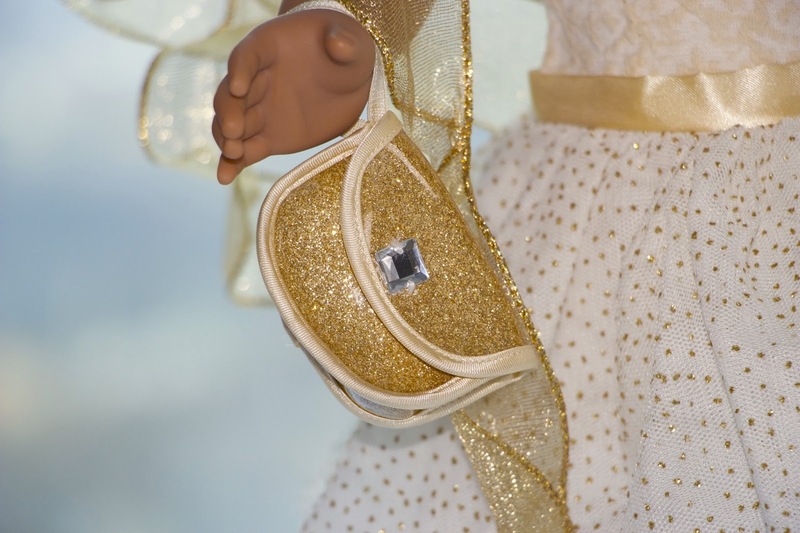 The dress comes with a sparkly golden purse that easily attaches to the doll's arm with an elastic band. 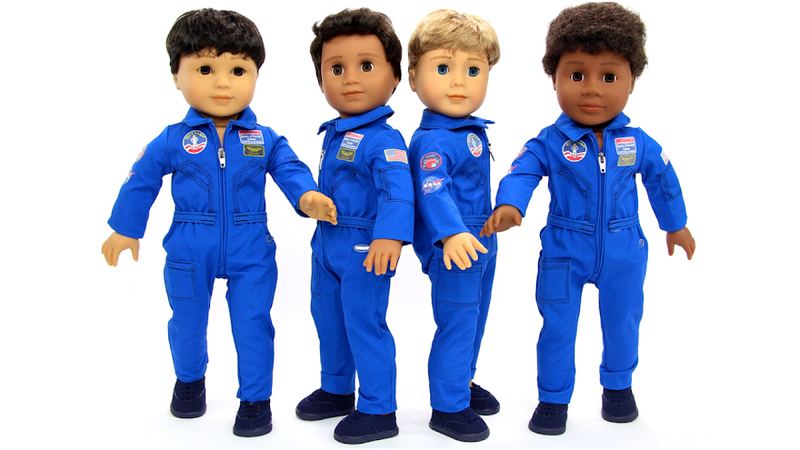 I hope every handbag that American Girl makes moving forward has this attachment. I love this fabulous purse! 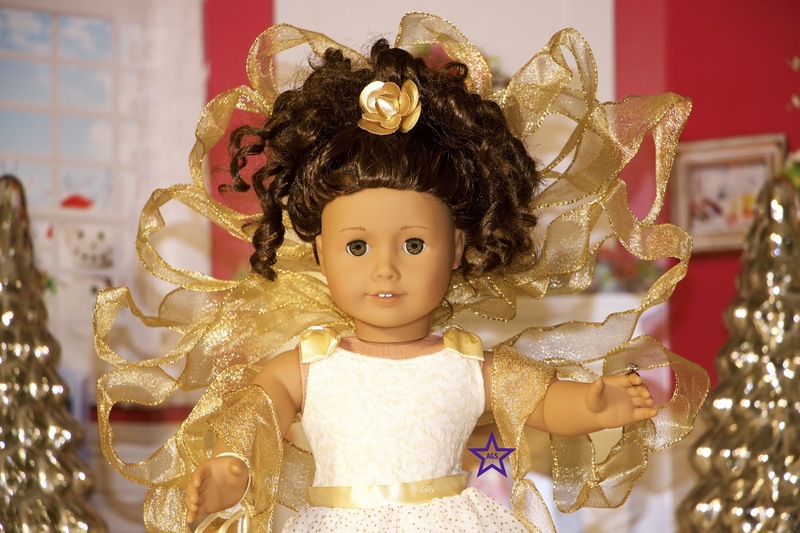 It's so important to have accessories to accent the outfit, American Girl got the perfect look for this dress. 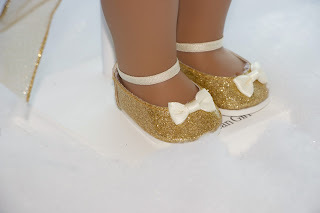 My favourite part of the outfit is these amazing sparkly golden ballet flats. The flats have cute little creme bows and an elastic to hold them in place. The elastic strap gives the flats a stylish look. 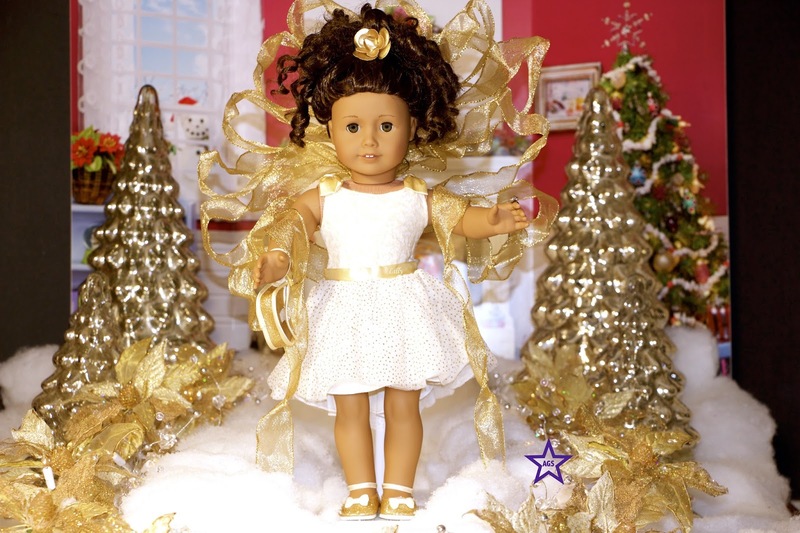 The final detail that American Girl added to this wonderful outfit is the metallic golden flower clip. 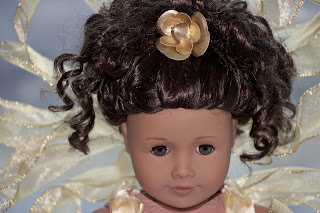 The flower has a bobby pin attached to it, so it's easy to place the flower in the doll's hair. It looks fashion fabulous with Lilly's hairstyle. I have added two accessories that I thought would add some extra glamour for the runway. A beautiful golden ribbon bow and a silver & gold ring to give the outfit a bit of extra shimmer. The ring is from the Truly Me Holiday Accessories 2015. Lilly looks very fancy in this stunning outfit. 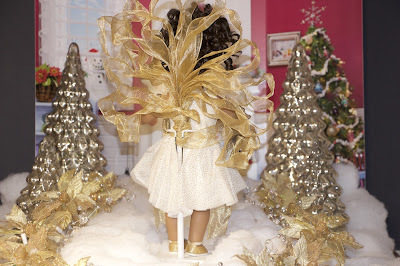 The Gorgeous Gold Outfit dress retails for $36 US on the American Girl website. It truly is a keeper. 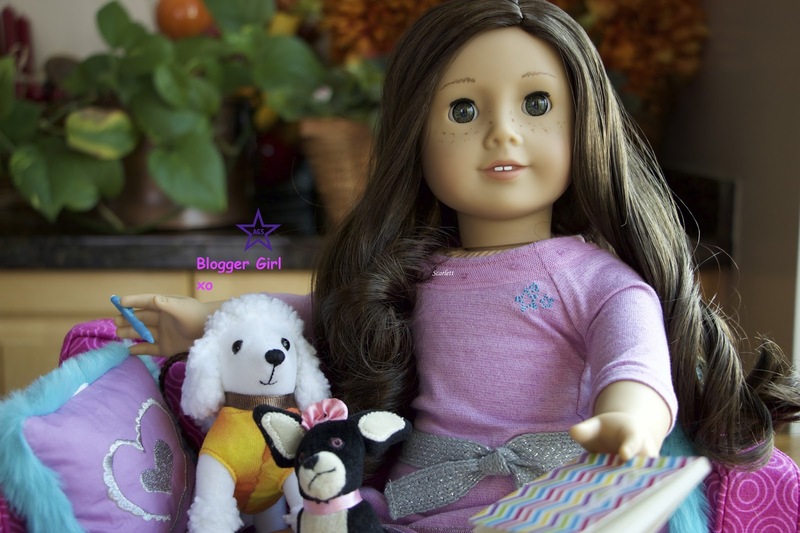 Click the link on the left to go to American Girl Spirit YouTube channel to check out the fashion show.